Thoughts on Growth is Reforge's weekly newsletter of must-known updates and perspectives in growth. By subscribing, you'll join a few thousand PMs, marketers, UX folks, engineers and analysts at today's top tech companies. Check out a recent sample below. In a world where growth is accelerated by data, machine learning is your gas pedal. But, ML projects are expensive, and a major challenge for buy-in, when you can't predict exactly what impact the results will have for the growth of your product. In the beginning, every ML is really going to be a combination of humans and machines. 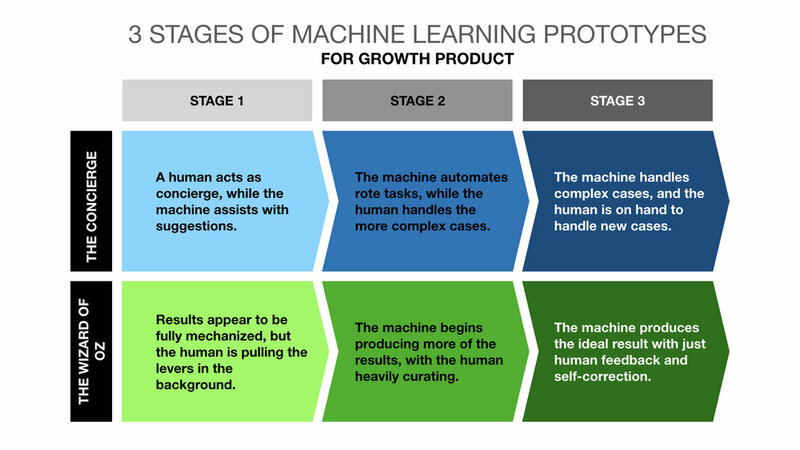 I see two versions for incorporating ML into your product or growth strategy. 1. The concierge - when you solve a customer’s problem yourself. AI plays an assistive role to the human who's in turn playing the concierge, all in order to get the job done faster. Over time the service is improved to automate more of the human’s tasks. And the most valuable learnings come from exposure to all the cases you didn’t think of when you conceived the service. The concierge MVP technique breaks down when you need large scale. 2. The Wizard of Oz - when you make it seem like it is all being done by a machine but it is really a human behind it. The UX appears to be fully mechanized but you actually have a human pulling the levers in the background. The more you already think you know about your customers and their problems the better a Wizard of Oz will help you validate and invalidate that knowledge. Should your customers be conned by a human or AI? What would you do with 10,000 interns? 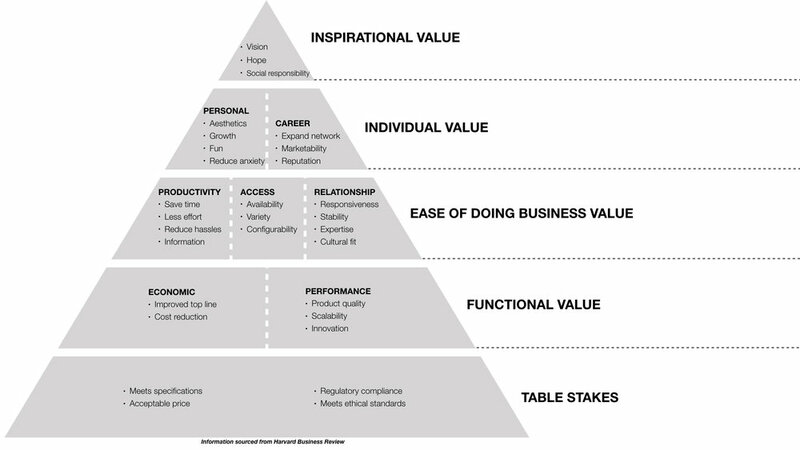 Prioritizing product value props is difficult. You want to tout them all, but which ones will actually move the needle on conversions? Based on a recent survey of 2,000+ decision-makers, researchers zeroed in on 40 elements of value that influence B2B buyers. “When you're looking at your product and your customers, frameworks and best practices can be helpful. They can crystallize thoughts and ideas that you've been working on. Maybe it will trigger a critical insight or bring attention to a blindspot. But, you obviously need to customize any framework with your own deep understanding of your product and customers, and the same holds true for picking from a list of value props. If your product team wants to know what customers value, have them answer support tickets. If you're B2B, have them sit in on a sales call. Very quickly it will become apparent what your customers value. The difficult part is when you realize that different segments of your customer base value very different, sometimes diametrically opposed things. Quantitative data has many champions. Numbers are firm, they look good in powerpoints. But we can get so caught up in the charts and the graphs that we can forget to take the time to simply talk to our users. You can only learn so much from a number. To really understand your user and why they are doing what your metrics are counting, you have to carve out the time to listen to them. “Data will tell you what happened, but it's not going to tell you why. Growth teams can get robotic in how we do experimentation, pick metrics, and analyze test results. At the end of the day, how does that tie to the narrative of the user? Does the data tell you why they're not using your products, or why they're not paying you? You're only going to get that by having a conversation with them. In all of the full-stack growth teams I've built, I've always had a dedicated user researcher. I expect designers and product managers to do it too, but the reality of the job is you're busy, and the first thing to drop is doing that interview. I'm so committed to user research that I always hired a go-to person for it — someone to drive that work, create leverage for the team, and aggregate it to make sure the learnings are shared and used, again and again. Our systematic approach to growth constantly married quant with qual, and that came from interviews, surveys, usability testing, and building feedback loops from customer support/success back into growth — all to ensure the user voice was included in our team's efforts to drive retention and monetization. User empathy is very important to me, and it simply drives better results. Instead of being data-driven, I always said we were 'data and user-driven.'" We often talk about virality in terms of contact importers, or apps that post to an existing social graph. But, more and more growth and virality can happen at the intersection of offline / in real life, and online (e-commerce is the biggest example that comes to mind). “Remember Bump? It’s worth noting that a ton of people installed it — 125+ million downloads and one of the top 10 most downloaded apps earlier in the cycle. There’s something really fun and compelling about in-real-life events driving digital loops. The IRL interaction of bumping your phone against someone else's is the same kind of viral hook that helped Uber to grow whenever friends requested rides together — it's an already-social action that naturally pulls in additional users, and wows them with a magical moment. But, a novel IRL viral hook like bumping your phones to share contact info isn’t a product in itself, and my understanding was that there wasn’t a lot of retention after than the initial gimmick of doing the bump. Get Thoughts on Growth delivered.